As G. Willow Wilson and Cary Nord’s WONDER WOMAN #58 makes clear, when it comes to Diana’s longtime fight against injustice…well, things may be more complicated than we thought. There's something about utilizing Wonder Woman to explore war that feels fresh and engaging. Maybe it's because women have historically been excluded from the frontlines. Maybe it's the fact that we're looking at it through the lens of a character who's fighting for truth and justice, which is often used as an excuse in the pursuit of real life wars, but is rarely actually the case. Wonder Woman is a character who's always chosen to actively put herself in war, which leads to a lot of questions about heroism, power and even privilege. WONDER WOMAN #58, which launches the new creative team of writer G. Willow Wilson (returning to the world of DC after much success at Marvel) and artist Cary Nord, immediately sees Diana throwing herself into harm's way once again as she learns that Steve Trevor has gone missing in an active war zone. This is immediately a strength, as ongoing Wonder Woman stories have often faltered by focusing too much on Steve or other male characters. Nord, along with inker Mick Gray and colorist Romulo Fajardo Jr., does a stunning job of depicting Diana and her world, whether she's curled up in bed or confronting armed men in the middle of the desert. The creative team also does well in choosing to have Diana there completely of her own accord, making this iteration of Diana at war particularly interesting because she has no allegiance except to what she thinks is right. Often Diana has been utilized as a tool of one power or another—her film incarnation is a good example in that she quickly became a warrior for the Americans in WWI, reflecting bullets off her gauntlets and shooting men in the head. This leaves no conversation for the complexities surrounding that particular war and leaves us feeling that Diana is easily influenced or unaware of the ramifications of her actions. Here, however, she only has one goal in mind: to save the man she loves. But rather than making her act irrationally, it allows her to follow her own moral compass, and in fact, the first people we see her take down are two American-allied soldiers about to murder a young boy. It's not just Earthly wars that Wonder Woman #58 looks to probe, but also the wider concepts of justice, revenge and repentance. The introductory pages give us a glimpse of what will likely be a wider theme as we're reintroduced to Darkseid's daughter Grail, imprisoned under Themyscira alongside the God of War, Ares. Their brutal interaction apparently sets off world changing events that will play out as the series goes on, and even that vital moment is an action that's spurred on by Ares and his quest for what he calls "ultimate justice." Nord, Gray and Fajardo Jr. craft a beautiful and energetic landscape, one in which Diana is always at the forefront, her power and integrity visible in every single panel. This version of Wonder Woman manages to look excitingly youthful while also possessing a gravitas that fits with the serious nature of Wilson's narrative. It'll be exciting to see where the story goes after this issue and the world that the art team creates as they build this new chapter for the Princess of Themyscira. The issue's final page is an intriguing one as we see Ares returned and attempting to coerce Diana into joining him so they can fight tyranny and injustice together. Historically, Ares has not exactly been an ally to Themyscira. But as this issue relies so heavily on Diana, her moral compass and her independence, we're left with the feeling that there might be the chance Diana could find something to relate to in her longtime adversary. We're left feeling that there's a possibility the crux of this story will be about Diana working out just what truth and justice mean to her and how far she'll go to achieve the ideals she's fought for all of her life. 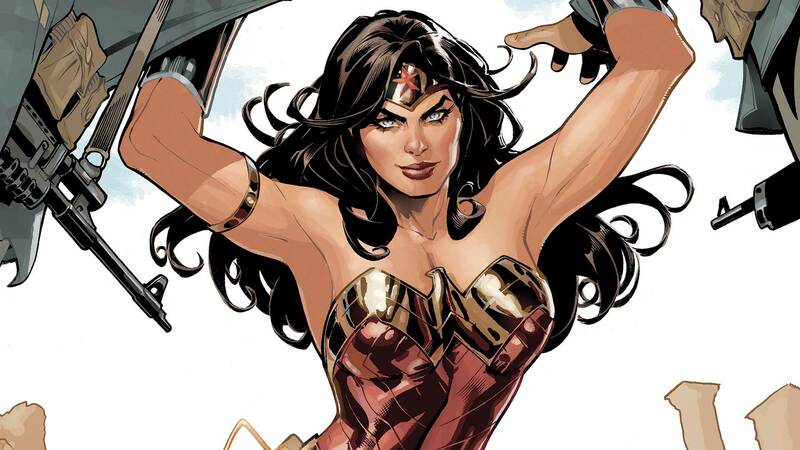 Wonder Woman has long been one of the most inspiring and powerful characters in DC's roster of heroes, and Wonder Woman #58 continues this legacy. Thankfully, it places Diana firmly at the center of her story and the modern age while also using its 20 pages to begin an exploration of war, conflict and justice that’s as vital today as its ever been. WONDER WOMAN #58 by G. Willow Wilson, Cary Nord, Mick Gray and Romulo Fajardo, Jr. is now available in print and as a digital download.